Vietnam’s benchmark VN-Index moved forward on May 26, gaining 1.32 percent as investor sentiment improved, thanks to global recovery. The gauge of 230 companies and four close-ended funds listed on the Ho Chi Minh Stock Exchange finished at 492.69, 6.44 points higher than yesterday. 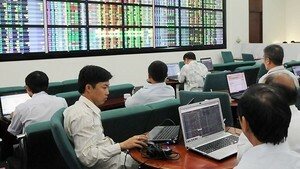 Trading volume was at 41.3 million shares worth VND1.27 trillion, the lowest level in the past 34 trading sessions. Liquidity on the market has fallen below 50 million shares for three consecutive sessions. Foreign investors remained the biggest net buyers on the city’s major exchange, pumping in more than VND43.4 billion today. 191 stocks gained, 19 lost, while 24 remained unchanged. Most blue chips rallied, however, banking and financial stocks declined or remained stagnant. Saigon Securities Inc. (SSI) was the most active stock by volume, with more than 1.76 million shares changing hands at VND36,800 or 0.27 percent down from yesterday’s close. It was followed by Saigon Thuong Tin Commercial Bank or Sacombank (STB), which saw 1.33 million shares traded. Ocean Group Joint Stock Company (OCG) came next with 1.2 million shares traded, up 5 percent to VND31,500. There were 8 companies, which added the daily maximum allowed limit of 5 percent, including seafood producer NTACO Co. (ATA), Cadovimex Seafood Import-Export And Processing Joint Stock Company (CAD), Information and Networking Technology Joint Stock Company (CMT) and Lix Detergent Joint Stock Company in today’s trading session. South Logistics Joint Stock Company (STG), which decreased 5 percent to VND30,400 from VND32,000 yesterday, led the losers on the city bourse. Investment Commerce Fisheries Corporation (ICF) dropped by 4.71 percent to VND16,200. Cao Thanh Dinh, a member of the company’s Board of Directors, sold all his stake of 9,500 shares from May 19 to 20. His wife, Duong Thuy Huong, also sold 28,000 shares between May 19 and 21. Seafood producer Hung Vuong Corporation (HVG), which located in the Mekong Delta Province of Tien Giang, closed down 4.65 percent. The northern market also advanced with the Hanoi-based HNX-Index rising 2.3 percent, or 3.58 points, to close at 159.48 points. Turnover was at VND958.7 billion with 32 million shares changing hands. The UPCoM-Index rose 0.33 points to 48.6. A total of 101,276 shares were traded at VND1.8 billion.